Wing span: 2 1/2 - 4 inches (6.4 - 10.4 cm). 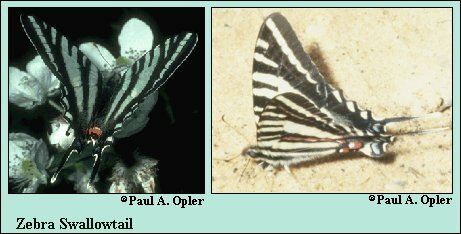 Identification:Upper surface of wings with black stripes on pale whitish-green background; hindwings have very long tails. Early-spring form is smaller and lighter colored. Life history: Adult males fly in the understory near host plants to find females. Females lay single green eggs on lower leaves of host plant. Caterpillars live and feed on the underside of these leaves, then pupate and hibernate there. Flight: Two flights, April-August, in the northern part of its range; many flights, March-December, in the south. Caterpillar hosts: Shrubs of the genus Asimina (pawpaw) in the Annonaceae family. Young plants are preferred. Adult food: Moisture from sand and nectar from flowers including blueberry, blackberry, lilac, redbud, viper's bugloss, verbena, dogbane, and common milkweed. Habitat: Breeds in moist low woodlands near swamps and rivers. Adults fly to nectar plants in open fields and brushy areas. Range: Rare in northern part of range. Management needs: Maintain host trees in various stages of succession.